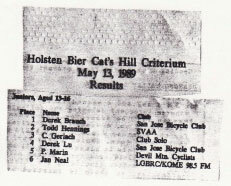 When the juniors' category was much more robust than today Cat's Hill was the first race I ever won, a day I will never forget. I believe the junior categories back then were split 14-15 and 16-17 with your racing age you age on the previous Jan 1. I did the 14-15 race. I still have a copy of the results (see attached). It was the first race my dad missed due to work (or course) and this was way before cell phones etc so I had to wait until he got back from his trip to show him my gold medal. It was the first time I did the race and the plymouth reebok junior team, which was dominant at the time, had a good five riders in it. They sat at the front and every lap I attacked just prior to the hill. Eventually just Todd Hennings and I were off the front. I was a far inferior sprinter to Todd but the short sprint played to my advantage; coming down the back straight I led, and let Todd start to creep up the inside but as we neared the corner I took the apex, forcing Todd to have to brake, lose speed, and have to cross to the outside to start his sprint after the corner. Even after all that he nearly beat me. 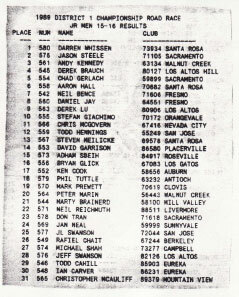 I'm nearly positive Huber won the pro race that year, I see there's a gap in your winner's timeline for '89 pro winners.